For over 25 years, Motorpsycho have constantly pushed at the limits of what’s possible within the rock format, becoming a prog band almost by default as their songs have got longer and more exploratory. Starting with 2008’s Little Lucid Moments, they’ve gone through a remarkable purple patch over the past decade, producing an album practically every year while also finding time to soundtrack a series of theatre productions. Not everything’s been plain sailing, though. Last year’s Here Be Monsters got some of the best notices of their career, but it was a surprisingly introspective album, its languid Floydian vibe sometimes tipping over into enervation and burnout. Then Kenneth Kapstad, the band’s drummer for the last 10 years, announced his departure, leaving Motorpsycho’s founding duo of Bent Sæther and Hans Magnus Ryan to regroup and plan their next move. A major work in every sense, expansive but consistently excellent. And what a move it is. The Tower is a major work in every sense, an expansive but consistently excellent double album, and nothing less than a creative rebirth. 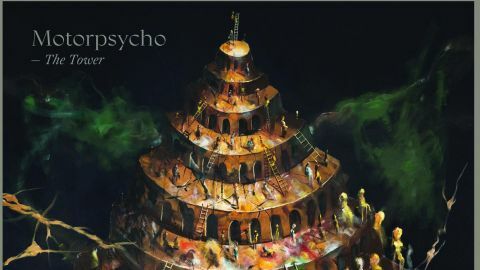 After all these years, it’s quite astonishing how Motorpsycho are able to produce such quality material while still finding new angles on their core sound, something that speaks volumes about their sheer focus and commitment to the band ethos. In particular, new drummer Tomas Järmyr seems to have relit the fire in Motorpsycho’s belly, with many of the songs here rocking harder than the band have done for some time, yet never just resorting to empty bombast. The opening title track perfectly captures the album’s mood and its overwhelming sense of ambition, the dreamy fairground Mellotron intro leading into a classic three-part Motorpsycho riff that ripples with majestic power. Sæther and Ryan’s Jon Anderson-esque harmony vocals are also present and correct – in fact, there’s a number of times on the album where Motorpsycho resemble Yes minus the pseudo-classical pretensions, plus a dash of early King Crimson. The driving Bartok Of The Universe is even more dramatic, a cosmic battle hymn that hints at the baroque metal of prime-time Judas Priest and Iron Maiden. And then A.S.F.E. pushes even harder on the accelerator, fighting for the right to party at the end of the world. Of course, it’s not all breathless propulsion – Stardust and the epic A Pacific Sonata showcase the band’s mellower, more reflective side, evoking summer evenings spent in the land of the midnight sun. But closing track Ship Of Fools returns to the widescreen art rock sound that defines The Tower, another big riff that passes through light and shadow before stretching off to the horizon.